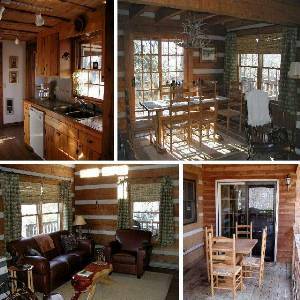 This luxurious 2 bedroom plus loft log cabin is charming and private with all extras including hot tub, wood-burning fireplace and wrap-around porch. This wonderful log cabin is an absolute charmer - just what you dream about when you want to experience the mountain life. The hand-hewn authentic logs, the hardwood heart of pine floors, the 30 ft. stacked stone wood-burning fireplace, exposed beams and many other extras are prefect for offering the mountain atmosphere. Each article in this cabin was chosen with care and taste for the astute vacationer who wants a little extra pampering. All of the furniture is unique and the best quality. All of the linens are Pottery Barn from the goose down quilts and duvets to the luxurious towels and sheets. 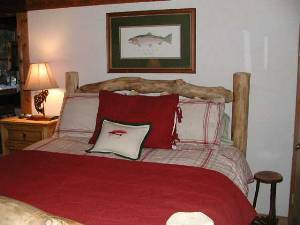 The house is furnished with many mountain crafts, antiques, original paintings and eclectic knick knacks. On your visit you will spend a great deal of time just walking around looking at all the wonderful details. The two bedrooms each have a comfortable queen size bed and there is an additional day bed on the main level in case you have a little extra company or child. The two bathrooms are also charming with log mirrors and over-fluffy towels and look out onto the mountain greenery with one window facing a bed of wild ferns. The living room has leather sofas and hand made tables, custom drapes, and beautiful floor covering scattered on the hardwood floors. The dining room seats 6 with a deer antler chandelier overhanging the table. The sitting room has an additional sitting area and closets loaded with games and things to do, and this cabin has just added a combination air hockey/ping pong/pool table for more indoor fun! The outside of the house is just as charming as the inside with a wrap-around porch with swings, and rockers, stick furniture and best of all the hot tub. The privacy of this property allows you to roam freely around the property and enjoy its beauty. This house is in the heart of historic Valle Crucis and only 2 miles from the historic Mast General Store. It is also centrally located to all tourist attractions and is within 10 minutes of the ski slopes, snow tubing, shopping, water rafting, and Appalachian State University. 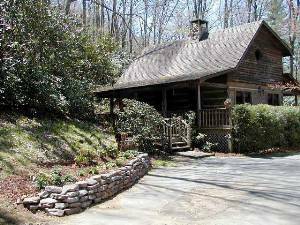 This Valle Crucis NC Log Cabin rental is another of our most wonderful vacation homes. We promise you a 4 star vacation with this house. Please remember, 4WD or chains are always recommended when visiting the mountains in winter. 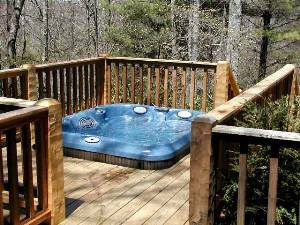 AMENITIES: Hot tub, combination air hockey/ping pong/pool table, private, wooded, stone faced wood burning fireplace, satellite tv (3), VCR, DVD, Gamecube, AC – window, gas grill, rocking chairs, porch swing, outdoor dining, washer, dryer, telephone, dishwasher, icemaker, microwave, DOG FRIENDLY. Hiking, Rock Climbing, Climbing Wall, Spelunking, Biking, Mountain Bike Trails, Golf, Miniature Golf, Fishing, Fly Fishing, Trout Farm, Wildlife Viewing, Waterfalls, Horseback Riding, Shopping, Go-kart racing, Bowling, Live Theater, Restaurants, Cinemas, Museums, Sightseeing, Rafting, Kayaking, Canoeing, Downhill Skiing, Sledding, Ice-Skating, Cross-country skiing, Snow Tubing, Highland Games, Grandfather Mountain, Close to Beech, Appalachian, Hawksnest & Sugar Ski Resorts, Blue Ridge Parkway, Festivals, Music, Outlet Shopping, Antiques, Crafts, Gem Mining, Tweetsie Railroad, ASU, Linville Caverns, Linville Falls, Appalachian Trail.